I adore these Sam Edelman booties. Although, as with most every shoe choice I debate. And subsequently second guess how they will look on me. But accounting for the fact that I no longer live where sandals are acceptable all year anymore.....Ahh Chicago and your seasons! 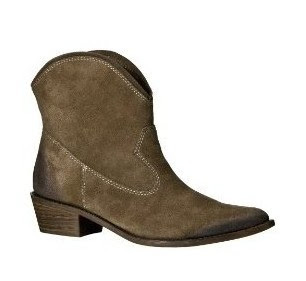 I need this ankle style of boot & see sooo Cute! And then a couple days ago while reading one of my favorite blogs, CouldIHaveThat, I was like whoa! I knew I needed to get these boots! Samantha looked great rocking them - the push I needed to go grab a pair of my own. I liked 10bajillion times more than before! Look how great she looks rocking them in summer gear, and we know they will transition great. Then I noticed where she mentions getting hers from. Targ-eee (You know Target but the fancy way to say it, Targ-ay....). Ok bird walk done, back to the point. WOW - look so similar. 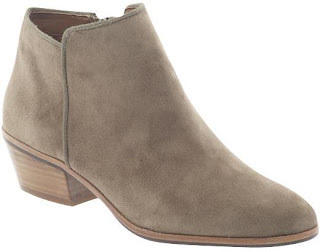 So I hoped over to T's website to see if they even carried them....And holy-stop the presses they are currently on SUPAH sale, $12.24!!! Umm You know I purchased them, you know to test! (Hubs, I NEEDED THEM!!!!). Now at least I'll have more to spend on another pair of fall/winter boots! for ONCE I like the Save better! Oh my gahhhhh! I need! What's the name of the Target ones so I can find them?! 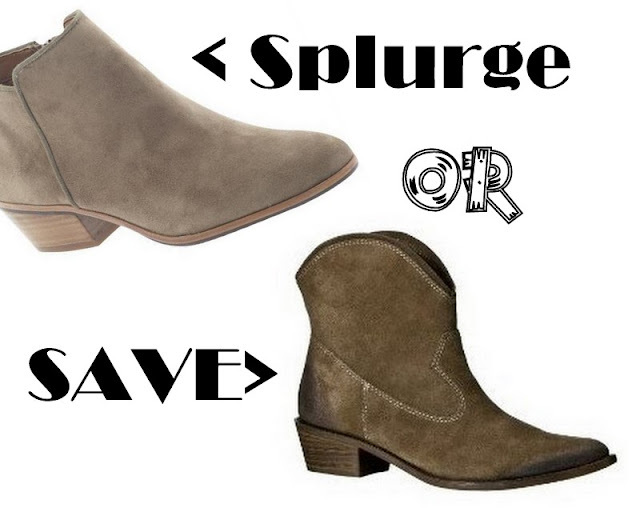 I love both, but I would do the splurge - only because cheap shoes (even the cutest ones) never have the proper support you need... can lead to all sorts of back problems! I know, I know, I sound like an old lady... just ignore me. Also these are the types that you will wear to bits... you don't want 'em falling apart on you! I would save and get the cheaper ones! Splurging is good but I honestly like the cheaper ones better! This one goes to the save! I love them both -- the color on the Sam Edelmans is hard to beat, but gotta go with Target for the price! okay stop it--TARGET?? I wonder if they have them in store?? The save! The save! Only because I bought them too! ;) 12 bucks??? Cannot pass them up! i did the same after reading her (couldihavethat) blog i immediatly went to target.com and bought these boots...i love them they dont look or feel chaep at all! !